As I have been reflecting on what I have written here over the last two years, I have also been taking into account what the data says about my site. 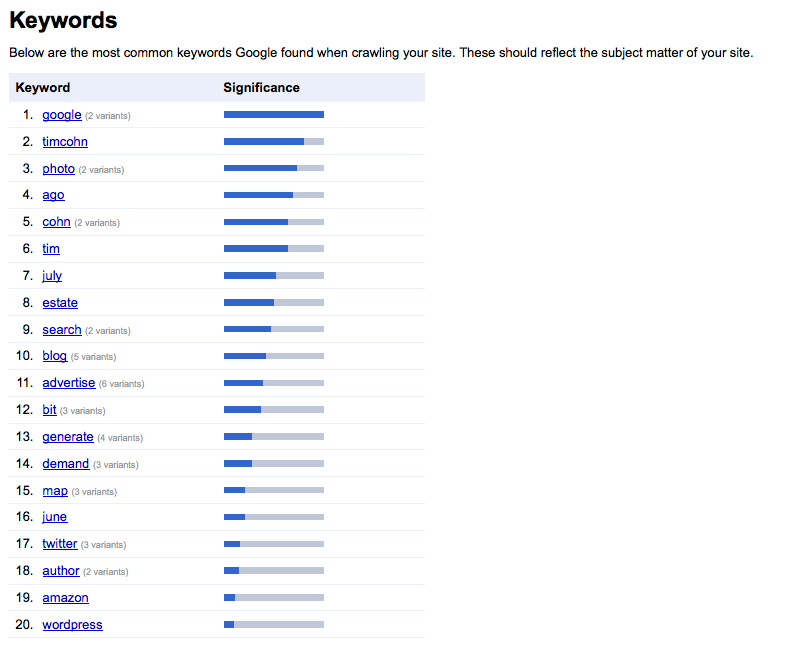 Google Webmaster Tools Top 20 Site Keywords for TimothyCohn.com shows what terms Google most often associates with this site. Unlike data from Search Marketing Communications which showed I had been on topic, this blog’s content appears to have been all over the map. I’m not sure why some of the terms are even showing up. There is one key takeaway – the Twitter feed showing down the right rail of this site contains my Twitter account name – timcohn. This keyword in turn shows up as the second most frequent term associated with the site because the Twitter feed has persisted almost as long as I have been blogging here.